The nation’s largest federal employee labor union seemed to push back on statements in support of the partial government shutdown made Thursday by officials from one of its member unions in a press conference with President Trump. Leaders of the National Border Patrol Council said Thursday a wall along the U.S.-Mexico border is an “absolute necessity” for Border Patrol agents, and said they supported Trump’s decision last month to reject a stop-gap funding bill and trigger a partial government shutdown. 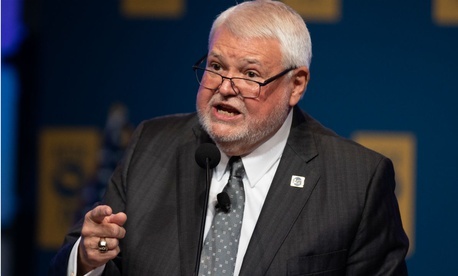 The American Federation of Government Employees took time on Friday to push back on the member union’s statements. AFGE has strongly supported every congressional effort to fund the government since last month. In a call with reporters, the union’s public policy director, Jacque Simon, also sought to pour cold water on the border patrol council’s statements. Federal employees are set to miss their first paychecks starting late next week, depending on their agency's exact pay schedule.